Hēni Materoa, also known as Te Huinga (1852/56?–1930) was born at Makauri, a few miles north of Tūranga (Gisborne). Her father was Mikaera Tūrangi of the Rongowhakaata tribe. 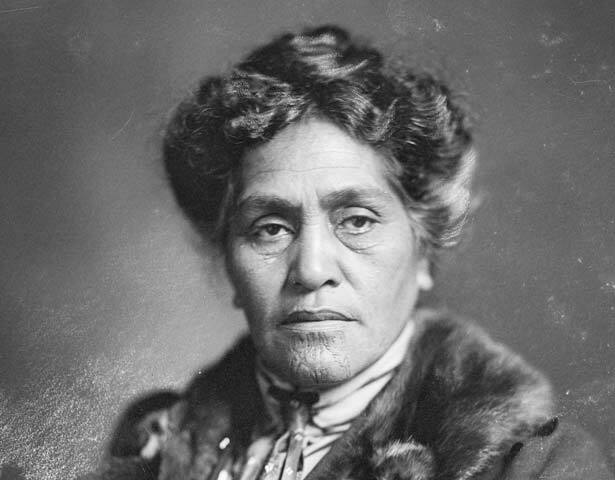 Her mother was Riperata Kahutia, an influential leader of Te Aitanga-a-Māhaki. In 1881 she married James Carroll, who in 1887 began a long career as Liberal Member of Parliament for Eastern Maori, and served as Minister of Maori Affairs between 1899 and 1912. Hēni Materoa's parents disapproved of the marriage, forcing the young couple to elope to Wellington where they were married in the registry office. The couple then moved to Gisborne. When her mother died in 1887 Hēni Materoa-Carroll took over her role as a leader of her people. She achieved great prominence, and was described as one of the great rangatira (chiefs) of Tūranganui. She did not join her husband in Wellington after his election to Parliament, but often entertained visiting parliamentarians and leading political figures - including Sir George Grey - at their Gisborne home. Hēni Materoa-Carroll helped to raise funds for Māori soldiers serving abroad during World War I, mainly through the Eastern Maori Patriotic Association, founded by Āpirana Ngata. She also worked tirelessly among the local Māori community, notably during the influenza epidemic of 1918, and raised funds and provided land for a children's home named after her. She was awarded the Order of the British Empire (OBE) in 1918. Hēni Materoa-Carroll died in November 1930. I whānau a Hēni Materoa (1852/56?-1930) ki Makauri i te raki o Tūranga. Ko Te Huinga tētahi o ōna ingoa. Ko Mīkaera Tūrangi tōna matua, nō te iwi o Rongowhakaata. Ko tōna whāea ko Riperata Kahutia, he wahine whai mana o Te Aitanga-a-Māhaki. Nō te tau 1881 ka mārena a Hēni i a Timi Kara. I te tau 1887 ka pōtitia a Timi Kara ki te Pāremata hei Mema Māori mō Te Tai Rāwhiti, ā, ko ia te Minita mō ngā Take Māori mai i te 1899 ki te 1912. Kāore ngā pakeke o Hēni i whakaae ki tā rāua moe. Kia ahatia, ka rere te tokorua rā ki Te Whanga-nui-a-Tara mārena ai ki te tari rēhita. Ka noho rāua ki Tūranga. I te matenga o tōna whāea i te tau 1887, ka tau te mana ārahi i tōna iwi ki runga ki a Hēni. Ka nui rawa atu tōna tūranga, kīia ai ia ko tētahi o ngā tino rangatira o Tūranganui. I te urunga o tana tāne hei Mema Pāremata, kāore a Hēni i whai i a ia ki Pōneke, ka noho kē ia ki Tūranga. Ahakoa tērā, he rite tonu tana manaaki i ngā mana tōrangapū – tae atu ki a Tā Hōri Kerei – i tō rāua kāinga i Tūranga. I te Pakanga Tuatahi o te Ao, ka whakahaerehia e Hēni ngā kaupapa mahi moni hei tautoko i ngā hōia Māori kei tāwāhi. Ko te nuinga o ēnei o ana mahi ka kawea e te Rōpū Māori o Te Tai Rāwhiti Āwhina i ngā Take o te Whawhai (Eastern Māori Patriotic Association), he rōpū nā Āpirana Ngata i whakatū. Kāore i mutu tana hurihuri ki ngā kāinga Māori. Me kōrero tana pēnei i te urutā rewharewha o 1918. Ka mahi moni ia mō tētahi whare ruruhau mō te hunga taitamariki, ka tū ki runga i tētahi pito whenua nāna i tuku. Ka tapaina anō te whare nei ki tōna ingoa. Ka whakawhiwhia ia ki te Tohu o te Emepaea o Peretānia (OBE). Ka mate a Hēni Materoa-Carroll i te tau 1930. We have 5 biographies, 5 articles, related to Hēni Materoa Carroll.